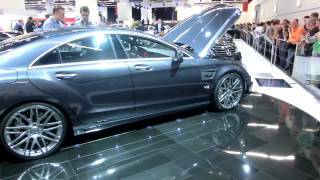 Based on the new Mercedes CLS generation, Brabus unveiled the Brabus Rocket 800 at the Frankfurt Auto Show. 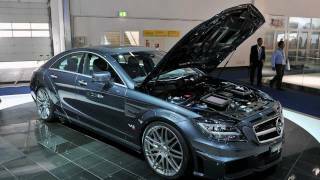 The Brabus Rocket powered by a V12 Biturbo engine that produces 800 hp of power and a humongous 1,420Nm of torque (though limited to 1,100 Nm in the car) for stability. The exclusively appointed Brabus Rocket 800, built to order starting at EUR 429,000, reaches a top speed in excess of 370 km/h (230 mph) and accelerates from 0 to 300 km/h (186 mph) in just 23.8 seconds. The world debut of the new Brabus Rocket 800 from Brabus at the 2011 IAA in Frankfurt/Main now continues this unique success story. 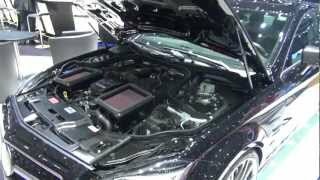 The high-performance automobile based on the new Mercedes CLS generation is powered by a Brabus 800 V12 Biturbo engine that produces 800 hp (788 bhp) / 588 kW of power and a peak torque of 1,420 Nm (1,047 lb-ft), which in the car is limited to 1,100 Nm (811 lb-ft). The exclusively appointed Brabus Rocket 800, built to order starting at EUR 429,000, reaches a top speed in excess of 370 km/h (230 mph) and accelerates from 0 to 300 km/h (186 mph) in just 23.8 seconds. 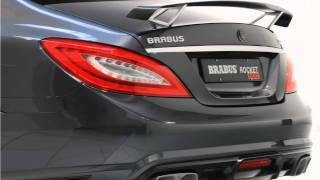 With the longest available final-drive ratio the Brabus Rocket 800 reaches a top speed of more than 370 km/h (230 mph), making it the world's fastest street-legal sedan. But this exclusive high-performance automobile is tops in other areas as well: 0 - 100 km/h (62 mph) in 3.7 seconds, 0 - 200 km/h (124 mph) in 9.8 seconds and 0 - 300 km/h (186 mph) in 23.8 seconds are figures that are as unique as this Brabus automobile itself. To keep the enormous performance of the world's fastest sedan safely in check at all times, the vehicle's aerodynamic properties, suspension and brakes were modified extensively. The air vents in the front fenders are part of the sporty-elegant yet understated appearance of the four-door car. Brabus side skirts with integrated LED entrance lights calm the airstream along the vehicle's sides. They also form a transition to the carbon-fiber fender flares on the rear axle, which add 40 millimeters (1.6 in.) 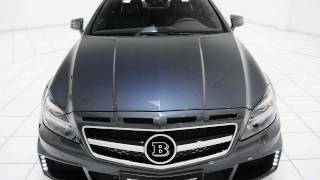 to the width of the Brabus Rocket 800 compared to a stock CLS.